Even with my new camera's "kids and pets" photo-taking mode, I can still barely get a photo of him. 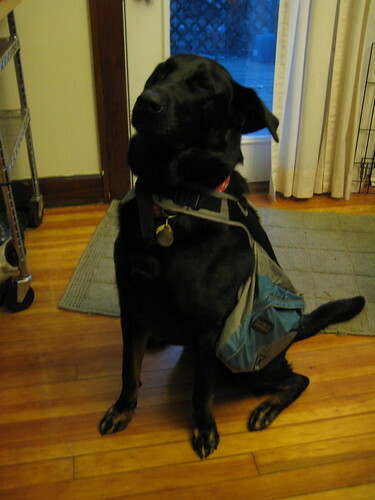 Here is my dog (forgiven since the iPod incident), trying on his Christmas present, a doggie backpack. My goal is to load it up so he has to work harder on his walks, consequently wearing him out. Maybe he'll be less likely to eat everything I own!! (again, the green walls make for some crappy photos).